A deconstruction of UK peaker economics illustrates how asset returns are becoming increasingly dependent on wholesale market margin. A major transformation is underway in European power markets. Ageing coal, gas and nuclear plants are retiring and being replaced to a significant extent by renewable capacity. Loss of existing flexible plants and the inherent intermittency of wind and solar output is driving a requirement for substantial investment in new flexibility. Interconnector investment and transmission upgrades can play a role in facilitating the more efficient integration of existing system flexibility. Batteries are emerging as a key provider of balancing services, although not yet load-shifting (as we set out last week). There is also a technology driven push towards more demand side flexibility. But there remains a key system requirement for flexible thermal generation capacity. Investment in flexible thermal capacity over the last 3 decades has been dominated by large grid connected CCGTs. But investment in distribution connected peakers has surged over the last 3 years, particularly as a source of new capacity in the UK power market (with 3.5GW successful in UK capacity auctions to date). Peaker investment is now focused on gas-fired technologies, particularly distribution connected reciprocating engines. These units represent a relatively cheap source of low load factor flexibility. However there are a number of different types of technology in play and an important trade-off between cost & efficiency. Gas engines have a capital cost advantage over CCGTs (400-450 $/kW vs 650-700 $/kW). Fixed costs of CCGTs (around 25 $/kW) can be more than 50% higher than those of gas engines. Engines are significantly more flexible than CCGTs and have lower start costs. Peaker economic lives are also shorter than for CCGTs (e.g. 15 vs 25 years) which reduces the risk of assets becoming uneconomic or stranded in later life. In today’s article we look at investment in UK gas engines as a case study of project economics and challenges. There are two main reasons why the UK has so far led European peaker investment. Firstly the UK faces a serious deficit of flexible capacity as older coal and gas plants retire. And secondly the policy environment is relatively favourable in defining clear sources of ‘stackable’ peaker margin. Capacity margin: Driven by the evolution of pricing in the UK capacity market. Energy margin: Driven by margin capture in the wholesale energy market & balancing mechanism (BM), a function of the evolution of spark spreads, peak pricing dynamics, volatility & imbalance volumes. Balancing services: Focused on revenue from the Short Term Operating Reserve (STOR) market, with peaker revenue potential from other ancillary services limited by alternative sources of rapid flex (e.g. batteries & pump hydro dominating frequency response services). Embedded benefits: Available to distribution connected peakers, with revenue predominantly driven by helping suppliers avoid demand charges (e.g. triad benefits), but taking a bit hit from the recent Ofgem decision to scale back embedded benefits. The challenge in quantifying risk & return across these margin streams is that they are neither mutually exclusive or independent. Margin can be ‘stacked’ across streams, but there is a strong co-dependence of returns. For example a peaker cannot provide committed STOR services at the same time it is operating in the wholesale market. Margin by stream (note margin potential depends on monetisation strategy and margin streams are not simply additive given codependence). Total margin required to earn a low to mid double digit IRR (note this in part depends on capex variance across different gas engine technologies). Capacity margin is the foundation of peaker investment. Uncertainty around this margin stream is reduced by 15 year capacity agreements with a fixed price (indexed to inflation). Peaker developers require the capacity price to clear above a certain level to support the project (e.g. in the 25-35 £/kW range). But once this is achieved this margin stream is relatively secure and can be used to support debt financing. The interaction between wholesale margin/BM and STOR/embedded benefits margin streams is much more challenging. Realistic quantification of margin capture in the wholesale market is the critical component of peaker economics. This requires robust probabilistic analysis of asset value capture from power price shape and volatility. In quantifying these margin streams, an optimisation approach must be adopted that is consistent with the way a trading desk actually manages peaking units in practice. Analysis of wholesale margin also depends on realistic assumptions about how peaking units can be optimised across codependent margin streams e.g. STOR, triads, wholesale energy & BM. Revenue stacking is not magic. In a post triad world it is tough to build a realistic margin case for gas engines that yields healthy double digit returns. 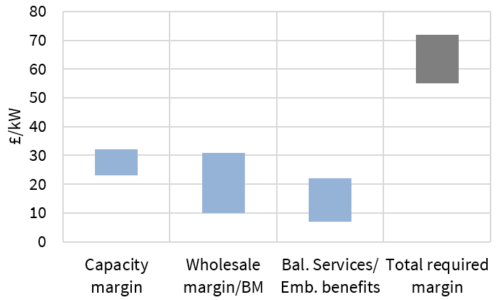 The definition of realistic margin numbers has to be founded on a pragmatic analysis of how wholesale and BM margin can be captured in practice as the UK market evolves. In building a viable investment case, there are a number of challenges a peaker developer faces. Securing advantaged sites. Sourcing competitively priced units. Access to financing. Site management. Unit operation and maintenance. Regulatory risk around revenue streams. But the toughest challenge is margin stream optimisation and market access. Margin streams for flexible generation units have traditionally been optimised by the established trading desks of large utilities. Here, the significant overheads of operating a sophisticated trading desk and risk management function are spread across a large generation fleet. Peaker developers can choose to outsource margin optimisation to an established trading desk. But this typically involves taking a significant margin haircut as well as giving away margin upside (via profit sharing). This can result in a major hit to project economics. This has driven the more established peaker developers to develop in-house commercial capabilities to optimise margin across co-dependent streams. While an in-house capability sounds sensible in principle, it is challenging for a relatively small peaker developer to match the scale and sophistication of a large trading desk. Good traders need practical experience and this means attracting them away from well paid jobs on established trading desks. Robust trading and risk management systems are expensive and typically require portfolio scale to support implementation. There are also a number of commercial and risk governance issues that require experienced headcount and processes. These functions are not the traditional domain of smaller scale asset developers. New CCGTs: relative project economics have improved significantly over the last 12-18 months, as has access to capital. Watch out for new CCGTs if capacity prices start clearing above 30 £/kW. Existing CCGTs: The capacity market is also supporting life extensions of existing CCGTs e.g. via bypassing steam turbines and running GTs (as a number of owners have already done). Interconnectors: More than 4GW is already under construction with a pipeline of 8GW+ behind. Batteries: Currently have specific frequency response applications but may be deployed more broadly from the later 2020s (see last week’s article). DSR: Over time, technology driven innovation is set to increasingly boost demand side flexibility. The growth potential of peaking units is a function of how these sources will compete in combination with renewable rollout, to drive the evolution of the UK capacity mix. Peakers are set to play an important role, but not necessarily a dominant role. ‘Timera Angle’ column provides shorter, sharper written content and analysis than our regular feature articles e.g. see our latest piece on ‘5 reasons why Trump doesn’t matter for decarbonisation’. ‘Timera Snapshot’ column is focused on fast dissemination of information using visual content such as charts and tables e.g. our latest piece on how ‘switching is boosting gas demand again in 2017’.